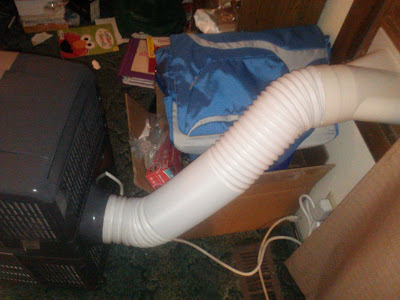 Get Cool With A Portable Air Conditioner! I don't know about you, but it is starting to get hot and muggy in the house we live in but it just seems just a little early to turn the central air on (especially since we had snow 2 weeks ago)! So, what did I do instead? 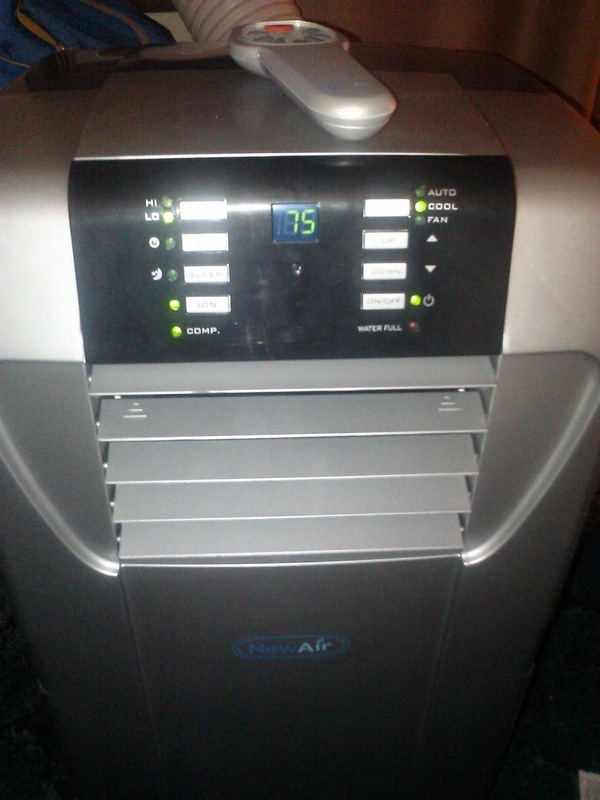 I turned to the new AC-12000E portable air conditioner that we received for review from NewAir USA, a manufacturer of home appliances that includes portable air conditioners, ice machines and ice cream makers. 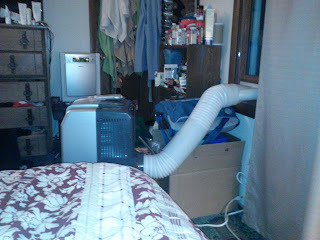 It was so EASY to set up and it instantly cooled down our room so we could sleep comfortably again! Portable and convenient, the NewAir AC-12000E cooling unit is built with 12,000 BTUs and covers up to 425 square feet. The AC-12000E air conditioner is environmentally friendly and designed with an auto-evaporative feature. 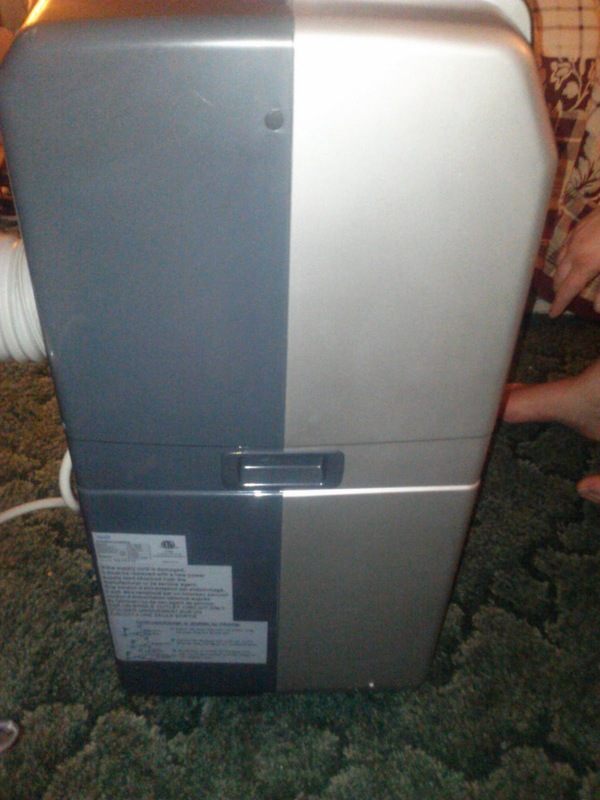 The NewAir AC-12000E air conditioner is highly reputable and rated as one of the top portable air conditioning units! This portable air conditioner from NewAir was really heavy in the box when it arrived so I was really nervous about setting it up. But it turned out to be really easy to set up with very little parts to assemble! I loved that! It only took about 15 minutes to unpack and set up and we were cooling down instantly! The AC-12000E eco-friendly air conditioner is built with a R410A refrigerant that provides cooler air while using less energy. The convenient auto-evaporative feature provides an improved cooling effect with less condensate build-up. 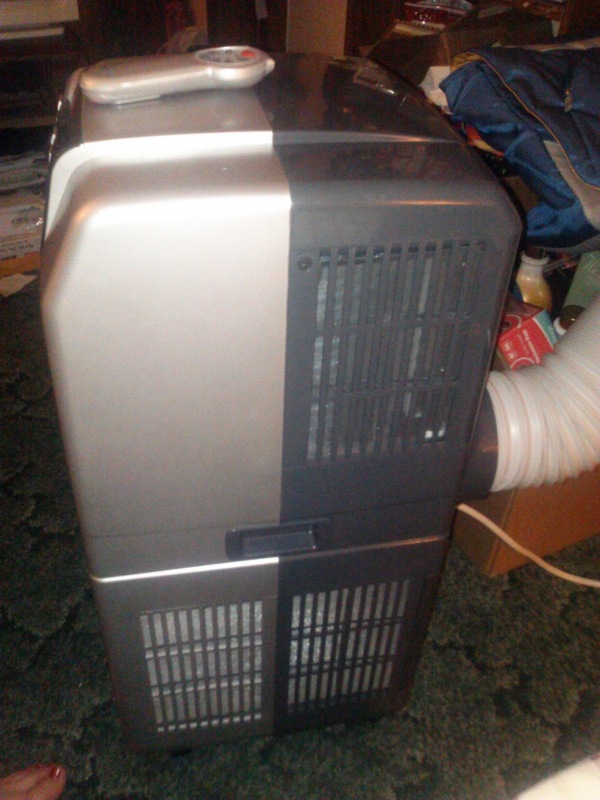 This NewAir AC-12000E portable air conditioner can operate on a continuous level by recycling collected moisture. The NewAir AC-12000E is designed with a remote control and a 24-hour programmable timer to adjust the temperature to a comfortable level at any time. Use your cooling unit as soon as you receive it! The portable AC-12000E air conditioner is easy to install without the worry of sitting there for hours and trying to assemble a product. A window kit is included which can be set-up within minutes. 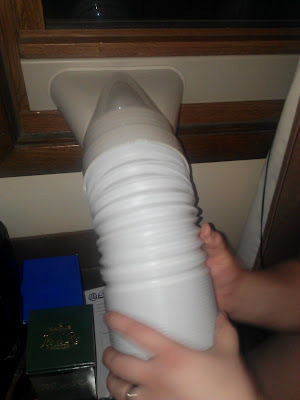 This was really the best part about this air conditioner! It can literally be set up and taken down and moved from room to room if needed in minutes! I really couldn't believe how easy it was to set up! You first start by setting up the window kit. It was easy to stick in the window and I loved that it blocked out heat and humidity from coming and fit snugly in the window. 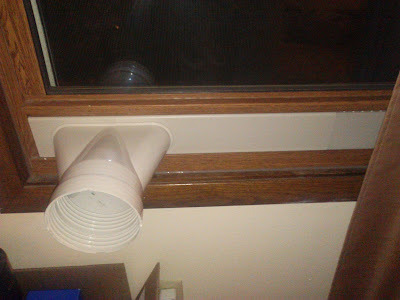 You then fit in the exhaust hose and screw it into both the window kit and the air conditioner unit: both very easy to do also! You are then ready to go! It is as easy as that! There is also an activated carbon filter that can be installed. 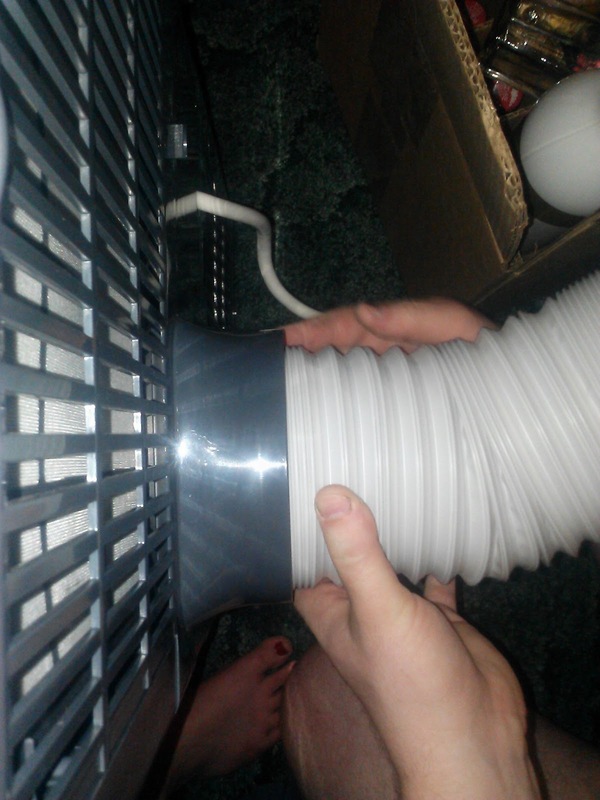 It is as easy as removing from the package and inserting it into the filter frame on the back! Then just turn on the unit On/Off button and away you go! Adjust the temperature up and down depending on what you want and even set a timer! You can also set the speed or set it to sleep mode! The indicator lights tell you when the compressor kicks on and when the water tank is full! That is really helpful! You can also adjust the front vents to shoot the air up or down! Another really nice feature is how easy it is to move around! It has handles on both sides for lifting and wheels on the bottom for easy movement! Overall, we really loved this portable air conditioner. 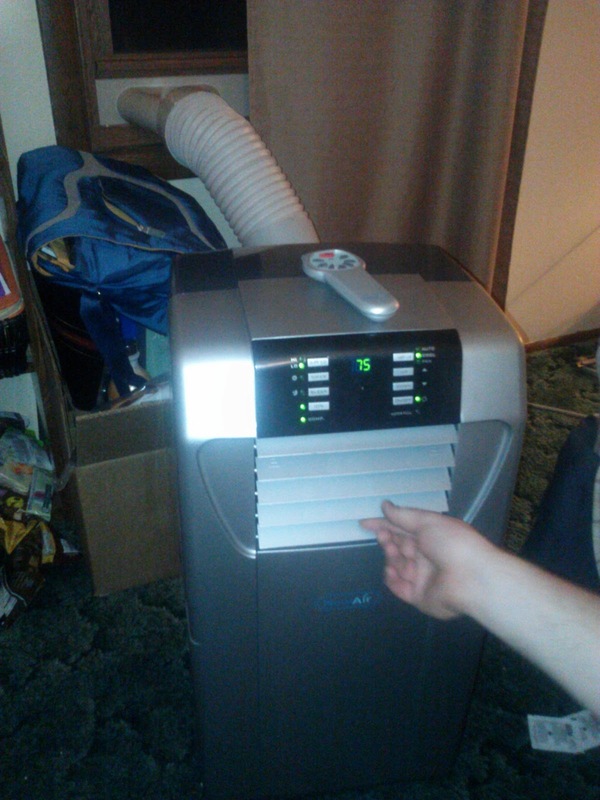 It is compact and can fit in any small room or area but it is powerful to cool down up to 425 square feet! It fit perfectly in our small bedroom and cooled it down in minutes! Plus, it was amazing how easy it was to set up and use! So if you are starting to heat up this spring but don't have central air or are just trying to heat up a small area in your home, garage, or other area, you have got to get the easy to set up, easy to use, and portable NewAir AC-12000E cooling unit! You will definitely appreciate it as the summer heats up and so do you! Buy It: You can purchase the NewAir AC-12000E cooling unit for an average price of $480 at a local retail location or online store. This is really a must-have especially not that summer is already approaching.